Cultists, always up to no good in "The Void." 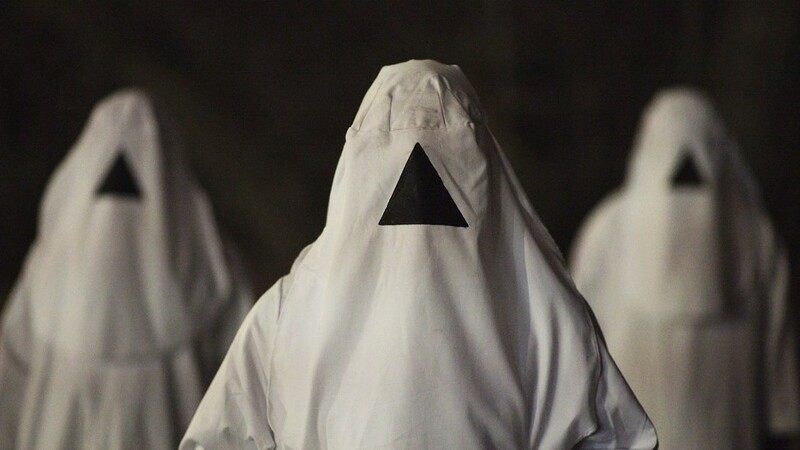 The founders of Canadian genre-film collective Astron-6,Jeremy Gillespie and Steven Kostanski, turn their eyes to the realm of Lovecraftian horror with "The Void." And while the directing duo load their film up with enough monsters and mutilation to populate an otherworldly hell dimension, their efforts are nearly undone by an undercooked story and muddled plotting. While making his nightly rounds, small town cop Daniel Carter (Aaron Poole) stumbles upon a bloodied young man and wastes no time in transporting him to the nearest hospital. In the process of shutting its doors for good, the building is sparsely populated with only a few patients, a couple of nurses -- including Daniel's ex-wife (Kathleen Munroe) -- and one severely out of her depth intern (Ellen Wong). Soon the small group is joined by a shotgun-wielding father and son (Daniel Fathers and Mik Byskov)who seem dead-set on unloading it on the still dazed man brought in by the officer. But before things progress too far, the strangers find themselves trapped when the building is surrounded by a stab-happy group of hooded cultists. No one's sure entirely what the cultists want, but it's safe to assume it ain't good. Although what lies waiting in the bowels of the hospital might be even worse. Aiming for a low-budget, 1980's John Carpenter vibe, "The Void" wears its influences on its sleeve: there's a bit of "Assault on Precinct 13" and "The Thing" mixed with a dash of "Hellraiser" and "Halloween II." What the film doesn't have is Carpenter's mischievous sense of humor, which might have broken up the film's deadly serious tone and given the proceedings a bit more zip. The script is sketchy on some crucial plot details and character motivations (it's never entirely clear how the story's disparate elements all fit together), but Gillespie and Kostanski come up with some great, truly creepy images. A shot of a field lined with robed cult members illuminated only by the flashing red and blues lights of a police car is wonderfully unnerving. But the real reason to see "The Void" is for its endlessly impressive, mostly practical effects. Fans of splattery makeup and gooey, rubber-suited creatures will definitely get their money's worth.